Free your dog from the dreaded cone! Big plastic cones are cumbersome. They make loud noises and scare your dog when your dog bangs into things. Forget eating & drinking and being in natural positions! And you know that the cone will be hitting into your legs and wacking the cat too. Imagine attempting to recover with all that plastic around your head! Luckily there other more comfortable options available. Have a look at the 3 recovery protection solutionss below and let your dog recover more easily. PROS: Soft, flexible, waterproof & durable material in the shape of a cone, the Soft Recovery Collar (previously called the ProCone) allows your dog to relax in natural positions. It's very breathable and the material is quite pliable so your dog can get super comfy. She'll be able to rest her head, eat and drink comfortablly and sleep easily. There are no sharp edges to irritate your dog’s skin. It's sturdy yet flexible. The cone itself is adjustable and fully machine washable. 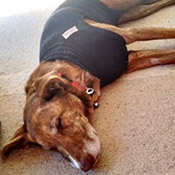 TIPS FOR USE: The Soft Recovery Collar works to stop your dog from licking an injury on ANY part of the body - as long as the cone is long enough to extend just beyond the end of the snout. It's vital that you do a Neck to Snout measurement (distance from where you dog’s collar sits under the chin all the way up under the chin to the end of the snout) as well as a Neck measurement (around where your dog wears a collar). BOTH measurements are essential to choose the right fit. The collar must be longer than the snout. If you use both measurements you’ll have a very comfortable and effective recovery collar. PROS: Durable inflatable collar which doesn’t restrict your dog’s vision or comfort. Soft & comfy like a neck pillow, the Inflatable Protective Collar (previously the ProCollar) can protect your dog’s injuries without restricting your dog’s vision at all or preventing your dog from reaching his bowl and water. PROS: Breathable, lightweight, 4 way stretch fabric suit that keeps your dog’s injuries covered & safe. Probably more comfortable than any type of neck collar could possibly be. Streamlined, breathable and stretchy. If your dog has skin sensitivities, hotspots or allergies the Recovery Suit provides excellent body coverage as well. It prevents damage from scratching and biting and also greatly limits contact with allergens. Air can circulate a wound and keep the area dry. TIPS FOR USE: The Suitical Recovery Suit is fantastic for preventing your dog from getting at injuries on the core body. The suit doesn’t have leg coverage so if you’ve got a paw or lower leg issue you’ll be better with one of the other options above. PROS: This is definitely the most comfortable option for any front leg injuries that need to be covered. You can't beat the streamlined coverage. Your dog will have freedom to eat & drink, free range of motion and no visual obstruction. Breathable, lightweight, stretch fabric suit that keeps your dog’s injuries covered & safe. You can definitely use it for skin sensitivities, lick granulomas, hotspots or allergies on the legs. It prevents damage from scratching and biting and also greatly limits contact with allergens. Air can circulate a wound and keep the area dry. TIPS FOR USE:The Suitical Recovery Suit is fantastic for preventing your dog from getting at injuries on the core body. The suit doesn’t have leg coverage so if you’ve got a paw or lower leg issue you’ll be better with one of the other options above.